Review Context: I’ve never played Theme Hospital, but I always enjoy playing management simulation games like Sim City 2000 (PC) and Sim Tower (PC). Two Point Hospital, developed by Two Point Studios, is a hospital management game developed by the same team behind Theme Hospital, an old PC hospital management game. 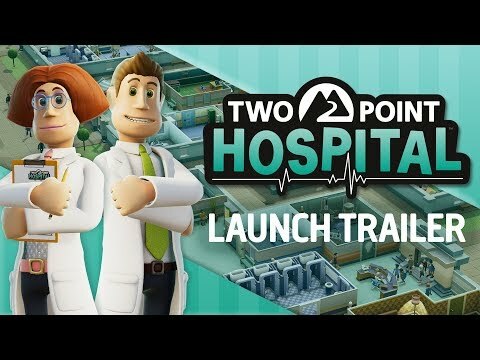 When Two Point Hospital was announced at E3 2018, I was kind of surprised by how intrigued I was by this kind of game because the presentation was very well done. I did have concerns about how all the elements would meld together for a good user experience. When starting Two Point Hospital you are tasked to build your hospital organization in Two Point County and you start your first hospital to begin learning the basics of building your hospital. 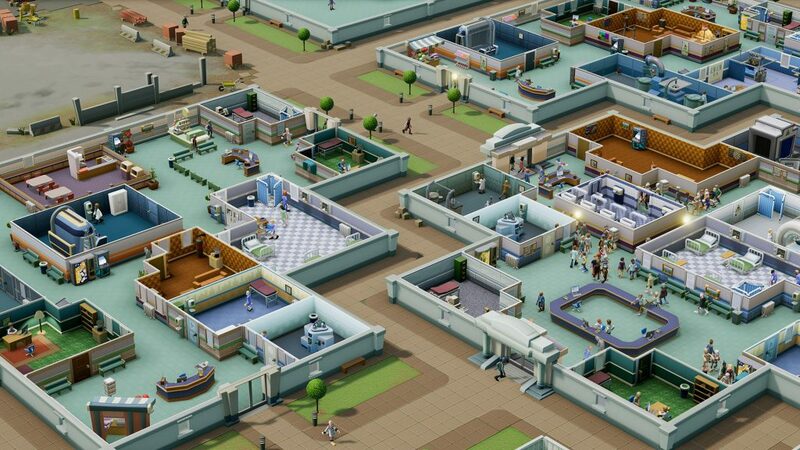 The tutorial in Two Hospital is very well done, walking you through every element of building a hospital. Each basic hospital has a general patient flow of receptionist to general practitioner, then diagnostics, followed by whatever specialist the patient needs to see. In the beginning of building your hospital organization you are on your first hospital, but soon you can move to another new hospital to build to learn new rooms and add better technology and more unlocked items to your existing hospital. Eventually, you will have a bunch of hospitals that you can switch between on the county map that you can upgrade. As you upgrade your hospitals, your hospital rating increases, thereby attracting more patients. I found this tutorial strategy to be very effective in introducing new elements to the game and is one of the reasons why I became glued to the game. Never once did I feel lost in not knowing what to do, but as new elements are introduced, management requires more attention. Two Point Hospital has many different made up illness that require different types of staff and special rooms in order for the patient to be cured. Some of these illnesses include Lightheaded, Freudian Lips, and Verbal Diarrhea, plus many others. For example, with Lightheaded patients heads are instead light bulbs and requires a special room with a device that can replace the patient’s head with a human head. Part of the fun in Two Point Hospital is being able to watch as these illnesses are cured, and some of them are very funny. Cures don’t always happen though, which is determined by your staff members. One of the things I really like about Two Point Hospital is the user interface, as I feel the presentation is as good as it can be for all the moving parts going on in this game. In Two Point Hospital you hire all your staff members, manage their breaks, wages, and even create a staff room for their enjoyment. Later in the game staff training is unlocked, which adds a level of customization to the game that you feel is kind of missing earlier in the game. In the beginning of the game you hire staff members from a list, with each staff member having different qualities for different things and a salary next to their name. The staff hiring list refreshes periodically in game time, so don’t be alarmed if your list is fully hired in the beginning because there is an endless supply of potential staff hires. For example, a receptionist would need to have the “Customer Service” quality to be effective, and a doctor would need to have the “General Practitioner” quality to be effective in the GP office. This doesn’t mean you can’t assign staff members who don’t have the best qualities, but their effectiveness and chance for cures becomes lower. 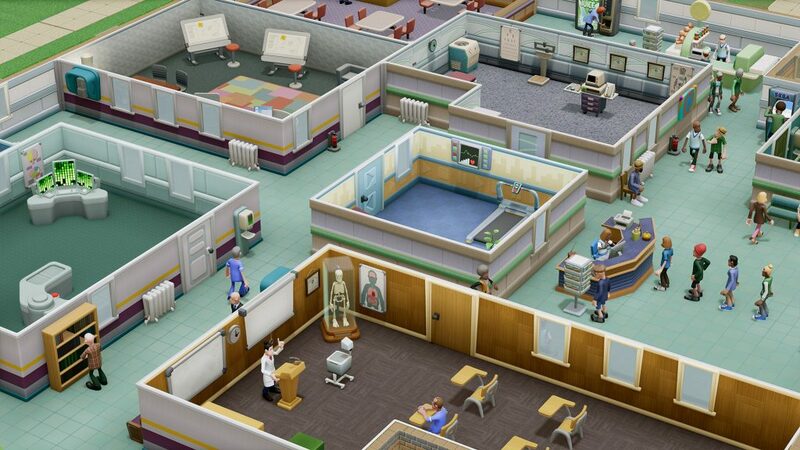 As you play a lot of Two Point Hospital you will have to decorate your hospital and rooms. In the game your hospital has a rating, sort of like prestige, which attracts patients to your hospital. Why would a patient go to a hospital with few amenities? Each room you create has a prestige rating, where if you place certain items in the rooms it increases the rating. It can be tedious, but it’s most efficient to add everything when you initially setup the room, even though you can always come back later and add more items or space for a room. A bunch of items will be locked when you first start and they require Kudosh, a special currency to unlock. Kudosh is earned when you complete challenges or objectives in the game. You do have a choice of what to unlock, which is another element of customization that I like. The game doesn’t hold your hand in telling you what hospital luxuries to buy, which will probably make everyone’s playthrough different. It is important to note that Two Point Hospital isn’t really a sandbox game because the game will always have objectives, which helps give you a sense of direction and usually gives you plenty Kudosh along the way, but I would still recommend spending conservatively. Later in the game, once your hospital empire has expanded to multiple hospitals, you will have the option to expand your hospital space. I found this to be refreshing, although I still think the space is so limited, considering all the different rooms and machine types that need to be built. Most rooms will only require a 3×3 space of blocks, but you quickly realize that space is limited once the lines for your GP office is long, so much so that you need to build multiple GP offices in order to accommodate all your patients. If you need space, don’t be afraid to take out a loan, as there are financial options in the game in case you are in the red. I found buying and repaying loans to be relatively easy in the game, so don’t shy away from it if you need to. The sounds in Two Point Hospital are decent enough, with soothing music in the background and a radio DJ that says funny things. I wouldn’t say this is soundtrack of the year, but everything is suited for this type of game, even what sounds like receptionist announcement. The game does have a multiplayer option where you can challenge friends on Steam to reach certain results, with the prize being money and kudosh. If you don’t have friends you can do those challenges with just the AI. Two Point Hospital is an impressive management game, giving you many tools to run your own hospital organization, like good charts, UI, and staff management options. Two Point Studios cured by fear going into playing this, as everything is taught and presented to the player clearly, even if it can get hectic sometimes, but that’s the challenge. I’ve invested many hours already and I will invest many more, as Two Point Hospital is a very addicting game and hard to put down.